What Do You Need To Feel Secure? One value that seems to hold a lot of people back from setting and achieving big goals is the need for security. Security is a feeling of certainty that everything is OK and that all your basic needs will be provided for. On the surface there’s nothing wrong with that. It’s great to feel secure. Abraham Maslow lists it as one of the basic human needs. If we don’t feel secure, we can’t move onto higher levels like love and self-actualization. If we have doubts about paying the rent at the end of the month, how can we possibly go after our really big dreams? You gotta feel secure first, right? So how is it that most self-made millionaires in America started broke or in debt? How is it that some people are able to start a new business while completely broke and with little or no income and with no guarantee of success? Do entrepreneurial risk takers simply have a lower need for security? If you read the biographies of very successful people, you see a common pattern again and again — from an external point of view, most of these people were not in a secure situation when they started going after their dreams. Sylvester Stallone was so broke he had to sell his dog in order to afford to keep shopping around his Rocky script (which no one would buy). Tony Robbins did his dishes in his bathtub because his tiny apartment had no kitchen. Brian Tracy was a day laborer. Og Mandino was a homeless drunk who wandered into libraries to stay warm. Babe Ruth started out in an orphanage. While some successful people start out with a lot of advantages, most don’t. Meanwhile, how is it that others who seem to be in a far more financially secure situation are paralyzed from taking action? People who have some money in the bank, a nice home, and a steady paycheck still don’t feel secure. Meanwhile, others with far worse starting positions pass them by. Why? The reason isn’t that some people need security more than others. I think everyone needs to feel secure. The difference, however, is that the entrepreneurial-minded define security internally while others define security externally. For example, those who can’t seem to take action will typically define security as $X in the bank, a house that’s fully paid for, a stable high-paying job with benefits, a solid relationship with the boss, a car that runs well, etc. Security is all about the externals. If the externals are stable, this person feels secure. But when the externals are threatened, such as the possibility of getting laid off, then this person doesn’t feel secure. This person will spend a lot of time striving to get these external factors in order. But the entrepreneurial action-takers define security internally. Security comes from trusting in yourself — in your ability to think and to take action. As long as you have the ability to think and take action, you’re secure. Given this mindset you could be homeless and still feel secure. Why? Because you still have the ability to think and act — your homelessness is only a temporary setback. It’s not a threat to your security. So even while you may be in a financially unstable situation, external circumstances don’t threaten your security. Your security is guaranteed. It cannot be turned off by external events. Now when it comes time to take action, you can see why one group will be paralyzed, while the other group will speed ahead. According to Maslow’s hierarchy of human needs, security is a more basic need than self-actualization. This means that you won’t be able to fully set and achieve big goals if you don’t feel secure. Security has to come first. So given that most people don’t start out with sufficient resources to satisfy the external definition of security, those that define their security this way won’t be able to take action to go after their dreams until all the external factors are met. They’ll be waiting and waiting until they have enough money to feel secure, and only after that happens will they be able to go after their dreams. Most of the time, this will never happen — the person will die before they satisfy all these external factors. On the other hand, if they do manage to acquire sufficient resources to pursue their dreams, and their security is again threatened (for example, they lose too much money), then it’s time to put the dreams on hold and re-establish external security. This is a hugely ineffective way to pursue your dreams. In most cases it just won’t work at all. You’ll spend your whole life pursuing security instead of self-actualizing. And sadly, this is what most people currently do. Now consider the entrepreneurial group who defines security internally. All you need to feel secure is to think and to take action. You don’t need any specific set of external circumstances to feel secure. You’re already secure because you believe in yourself. So you can move straight on to self-actualization, and you can stay there. You can continue to work on your dreams without pause. There’s no need to stop and satisfy some external need for security. Having an external locus of control is paralyzing. If you define security externally, you’ll always be victimized by factors outside your control. But an internal locus of control is empowering. If you define security internally, you’ll always have that need met, no matter what happens outside your control. And thus, you’ll always be able to take action on your dreams, no matter what happens. So how do you move from one group to the other? It’s nothing more than a choice. Just as you may have chosen to define security externally, you can choose to do the opposite. You can choose to look externally for verification of who you are and what you’re capable of (this is what most people do). Or you can look internally instead. Yes, it really is that simple, as stupid as it may seem. There’s no physical law that says you have to meet some arbitrary external security requirements before you can go after your dreams. You can be starting broke and in debt with no stable income, and you can still spend the bulk of your time going after your dreams. People keep doing this over and over and succeeding. If you define security internally (and you’re completely free to select this option), many obstacles that seemed to hold you back will just melt away. While you should pay attention to possibilities like running out of money, most people overemphasize these obstacles and become paralyzed by them. Money is an important resource to be sure. But time is far more important. When you run out of time, then you’re really done. But what happens when you run out of money? Did you know that you can run out of money and just keep on going? Running out of money doesn’t mean you have to stop living, and it doesn’t mean you have to stop going after your dreams. You don’t automatically die when you run out of money. No referee will show up and haul you off the field. The game doesn’t suddenly end. The typical self-made millionaire has been broke or nearly broke an average of 3.2 times before making their first million. There are consequences to going broke, and you may need to tighten your belt for a while, but that doesn’t mean you have to stop. Running out of money is largely an imaginary obstacle. For those who define security externally, running out of money is a huge personal threat, something to be avoided at all costs. But for those who define security internally, running out of money is just a temporary setback. Donald Trump experienced this setback, as did Walt Disney, Abraham Lincoln, and many others who went after their dreams with tenacity. It doesn’t matter where you’re starting from… whether you’re an employee or an entrepreneur, whether you have a lot of cash or are broke and in debt. Time is so much more precious than money. You can afford to lose all your money in the pursuit of your dreams. You can go broke over and over and just keep on going. But what you cannot afford to lose is time. Money can be restored. Time cannot. Even if you have no money at all, you can still think and take action. But when you run out of time, that’s it — game over. Each day of your life that passes is another day gone, never to return again. If you are paralyzing yourself with an external definition of security, you’re squandering your life away. If you aren’t spending your precious time working on your dreams — today, right now — then you’re just counting the days until you die. That external security will never come. The external factors will never be just right. If you are waiting for external security, you’re waiting for death. And in the meantime, you’re forgetting to live. So what are you waiting for? External security is an illusion. In the words of Helen Keller: “Security is mostly a superstition. It does not exist in nature, nor do the children of men as a whole experience it. Avoiding danger is no safer in the long run than outright exposure. Life is either a daring adventure, or nothing.” So which will it be for you? Have you chosen the daring adventure, or have you chosen the nothing? Now if you still think this is impossible for you… then here’s a freaky omen. 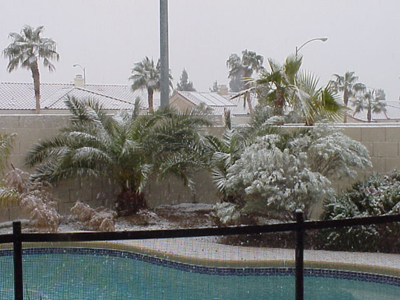 Right now, it is SNOWING IN LAS VEGAS! Excuse me while I go make some more snowballs….